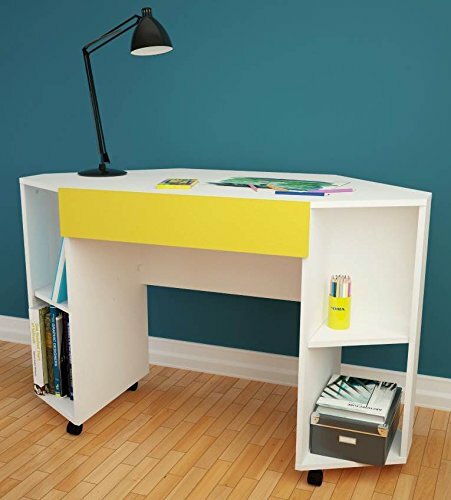 Taxi 331838 Mobile Corner Desk from Nexera, White and Yellow by Nexera at Indsight. MPN: 331838. Hurry! Limited time offer. Offer valid only while supplies last. Taxi Mobile Corner Desk from Nexera lets you maximize the use of space and features a convenient storage drawer on metal slides with 4 open cubbies. Taxi Mobile Corner Desk from Nexera lets you maximize the use of space and features a convenient storage drawer on metal slides with 4 open cubbies. The desk is finished all-around and mounted on casters for mobility; Taxi Storage Bench / Mobile Night Stand 332038 fits perfectly underneath the Taxi Corner Desk. Taxi Collection from Nexera is unique, fresh and smart. It offers tremendous storage capacity, convenient safety characteristics and a distinctive contemporary design, perfect for today's youngsters.